Originally Published: 2011. Bird Observer 39(3): 133-153. The fifteenth report of the Massachusetts Avian Records Committee (hereafter MARC or the committee) details the evaluation of 65 reports involving 46 species or subspecies. Fifty-seven records were accepted. All accepted records in this report were accepted unanimously on the first round of voting unless noted otherwise. Two new species have been added to the State List. A Little Shearwater (Puffinus assimilis) of the distinctive (and probably taxonomically distinct) baroli subspecies was documented in pelagic waters near Veatch Canyon in 2007. In addition, an old report of Kirtland’s Warbler (Dendroica kirtlandii) from 1916 was assessed based on the description in a published article and accepted as the first and only state record. This brings to 494 the total list of species accepted for Massachusetts. Other highlights in this report include the first state record of Pink-footed Goose (Anser brachyrhynchus), which was re-reviewed and accepted following last year’s acceptance of a 2008 Falmouth record; Massachusetts’s second Common Ringed Plover (Charadrius hiaticula), only the fifth for the lower 48 states; and, in the “it’s about time” category, MARC’s official acceptance of Newburyport’s famous Ross’s Gull (Rhododesthia rosea) of ‘75. This report also includes some intriguing records that were not accepted, highlighted by a Common Shelduck (Tadorna tadorna) record that very nearly passed (7–2 on the third round), but ultimately was rejected based on the thorny question of provenance. The list of species reviewed by the MARC (the “Review List”) is available at www.maavianrecords.com. Several changes to the Review List were made at the Committee’s February 2011 annual meeting. The committee voted to remove Cave Swallow (Petrochelidon fulva) and “Richardson’s” Cackling Goose (Branta hutchinsii hutchinsii) from the Review List, effective January 1, 2011. Historical records of each species through December 31, 2010, will continue to be reviewed. Moreover, the committee will continue to review both species outside of typical dates and areas of occurrence, as well as records of subspecies not yet confirmed from Massachusetts (e.g., P. f. fulva, B. h. minima, or B. h. taverneri). Motions to remove White-faced Storm-Petrel and Swallow-tailed Kite failed, and the committee will continue to review those species. The committee also voted not to add Boreal Chickadee to the Review List, based on the long history of irruptions into western Massachusetts with an average of more than three per year since 2000. Boreal Chickadee will be reviewed at the committee’s discretion, such as when it occurs in eastern Massachusetts, which has very few recent records. The MARC made several changes to its bylaws this year. The main changes were additional requirements and guidelines for creating ballots and commenting on records. These changes will provide more structure and encourage greater committee involvement in typically thorny issues like record date ranges, exact locations, and the particularly vexing “same bird” issues. Essentially, when faced with the possibility of a bird returning to the same site in multiple years, or the possibility of the same species reported from two separate places during the same period, the secretary will err towards circulating a new record for each sighting. If the majority of voting members believe that an accepted record probably pertains to a bird that was the subject of another accepted record, those records will be linked in the published data to reflect this connection. The MARC also approved a proposal by Naeem Yusuff to redefine the “Adjacent Ocean” within the MARC’s jurisdiction. Yusuff noted that the former definition created a “no-bird’s land” where, due to the position of the Hague line separating U.S. and Canadian waters, some U. S. waters were closer to Massachusetts than to any other state but were excluded from MARC’s purview because they were closer to Nova Scotia. The bylaws were changed so that the “Adjacent Ocean” within MARC’s purview will now include oceanic waters within U. S. territorial waters (i.e., south of the Hague line) and closer to Massachusetts than to any other state, within 200 nautical miles. MARC depends on birders of all skill levels in the strong Massachusetts birding community to provide evidence needed to evaluate and, more importantly, archive the state’s rich ornithological record. Individuals who have provided evidence, whether photographic (ph. ), video (v.), or audio (au. ), are noted in parenthesis in each account. The committee strongly encourages written submissions (signaled below with a “†”), even where photographs exist. The names of evidence providers are followed by the MARC record number. In addition, when known, we try to credit the discoverer either in the text or with an asterisk (*) if he or she has supplied evidence. As in the fourteenth report, this document provides specific geographic information for each record, including the location, town, and county (the latter is shown in italics). Species taxonomy and nomenclature follows the seventh edition of the AOU Check-list (AOU 1998) and supplements (e.g., Chesser et al. 2009, Chesser et al. 2010). Each species is listed with its scientific name the first time it is mentioned in the text, but not thereafter. Subspecies nomenclature follows the Clements Checklist of Birds of the World taxonomy (version 6.5), available at http://www.birds.cornell.edu/clementschecklist. The 2010 roster of MARC voting members was David Clapp, Richard S. Heil, Marshall J. Iliff (chair), Trevor Lloyd-Evans, Blair Nikula, Wayne R. Petersen, James P. Smith, Richard R. Veit, and Robert Stymeist. There have been several roster changes for the year ahead. Stymeist and Clapp retired after meeting their six-year term limit, Heil resigned, and Iliff was elected to serve a second term. Jeremiah R. Trimble was picked by special election to fill the one-year vacancy left by Heil, while Scott Surner and Mark Faherty were elected as new members. Matt Garvey was appointed for another year as secretary, and Marshall J. Iliff was re-elected chair. We thank Clapp, Heil, and Stymeist for their service as voting members. We also thank Erik Nielsen for considerable work on the MARC database over the past year, Naeem Yusuff for valuable assistance (including his clarification of the offshore boundaries of Massachusetts), and Trimble for his significant work compiling evidence and supporting the website even during his “off” year. Nikula and Lloyd-Evans provided valuable editorial assistance on this article. The MARC website <www.maavianrecords.com> has much more information, including the MARC bylaws, past annual reports, the State List, and the Review List. We plan to add species accounts for all review list species and hope that this will be of use to birders in Massachusetts and beyond to help understand the status and occurrence patterns of rarities in Massachusetts. Moreover, we hope to use the Internet to publicize the rich documentation in the MARC archives. This year, we report statistics after the species name for each rare bird. The numbers in brackets show the number of MARC’s accepted records in this report, followed by the total number of MARC accepted records for that species. Since the MARC still has not reviewed all the rare bird records for the state, we use a plus sign (+) to signal species that have records that have yet to be reviewed. Thus, [3,6+] signifies that there are three accepted records in this report and six MARC accepted records in total, but that we are aware of one or more additional reports that we hope to review soon. We do not use a plus sign for 2010 or 2011 records that are currently in review. Even where a subspecies is specified, the statistics given refer to the species unless noted otherwise. 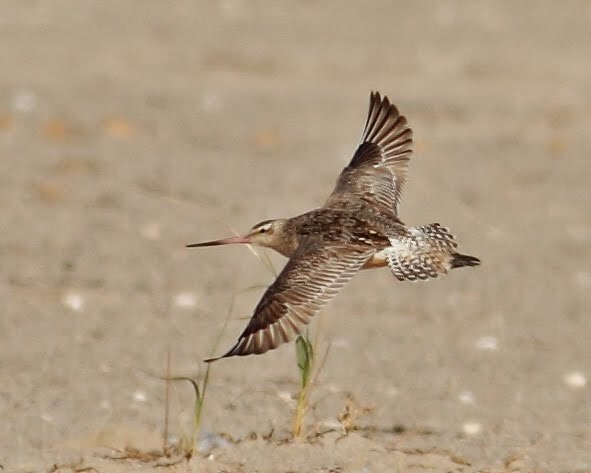 For example, because all records of Bar-tailed Godwit are reviewed, the statistics refer to the species, not to the subspecies group reviewed in this report. Species not on the Review List do not receive a count. The number of + signs in this report highlights how much work we have to do with historical records in order to provide a meaningful database of rarities. But it’s a labor of love, so please keep us busy—both by digging up any old documentation you have in an attic somewhere and by finding new birds for us to review! This adult Pink-footed Goose (note the barred flanks) was present in Dennis 16 Jan to 20 Feb 1999. It was considered “Not accepted” during initial review, which occurred in a time when Pink-footed Goose was known from just a few North American records from Quebec, Newfoundland, Pennsylvania, and Delaware (once). Since that time, it has drastically increased its population in Greenland and there has been a commensurate increase in North American records, with recent records accepted in most New England states. This individual is thus the first state record, although it was the second one accepted by the MARC; two more birds have occurred since and are pending review. Photo by Jeremiah R. Trimble. 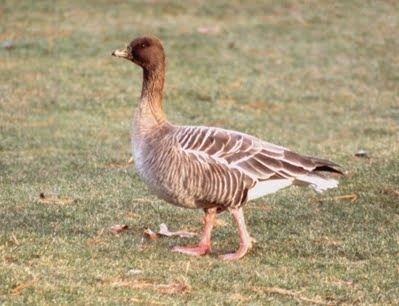 An adult Pink-footed Goose found and identified by Randy Fisher at the Dennis Pines Golf Course, Dennis, Barnstable, January 16–February 20, 1999 (ph. D. Crockett, †S. Smolen-Morton, ph. †J. 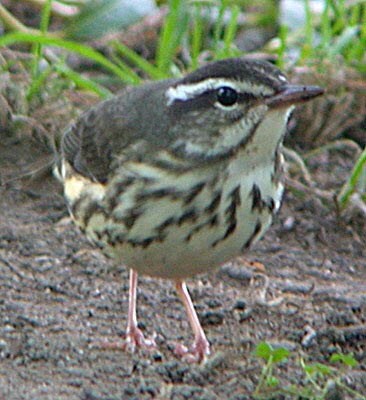 Trimble; 1999-24), was considered of “questionable origin” when first reviewed in 2002 (Rines 2002), in part due to the bird’s apparent confiding behavior. At the time the Dennis bird was seen, there were very few North American records, but many more records have accumulated throughout the Northeast since then. Following the acceptance of one at Falmouth, Barnstable, January 12–15, 2009 (2009-10; Iliff and Garvey 2010), and based upon a resubmission by Jeremiah Trimble, the MARC agreed to re-review the 1999 record. After two rounds, the Dennis record (1999-24) was accepted unanimously for the same reasons summarized by Iliff and Garvey (2010) for the Falmouth record: 1) Pink-footed Geese are rarely kept in captivity; 2) their numbers in the Northeast have been increasing steadily since the mid-1990s concurrent with a rise in the breeding population in Greenland, a known source for migrant geese in northeastern North America; and 3) the patterns of occurrence among the burgeoning number of records are consistent with wintering patterns of Greenland geese. The age ratio (all North American records pertain to adults) is consistent with the predominance of adults in other Greenlandic geese, e.g., Barnacle Goose (Branta leucopsis) and Greenland Greater White-fronted Goose (Anser albifrons flavirostris). The predominance of these adults may suggest that failed breeders join Canada Geese (Branta canadensis) at molting grounds in Greenland or Arctic Canada. The Dennis Pink-footed now represents the first record for Massachusetts. Notably, an adult in Sudbury/Concord, Middlesex, November 17–December 25, 2010, is currently under review by the committee as the state’s third record. Take a rest, you’ve had a long journey. Photo by Erik Nielsen. While a Martha’s Vineyard record of an escapee Barnacle served as a reminder that wild provenance should not always be taken for granted (see Records Not Accepted below), two other Barnacle Geese in known wild-goose hotspots corresponded to the pattern of occurrence that the committee now believes is consistent with natural movements. 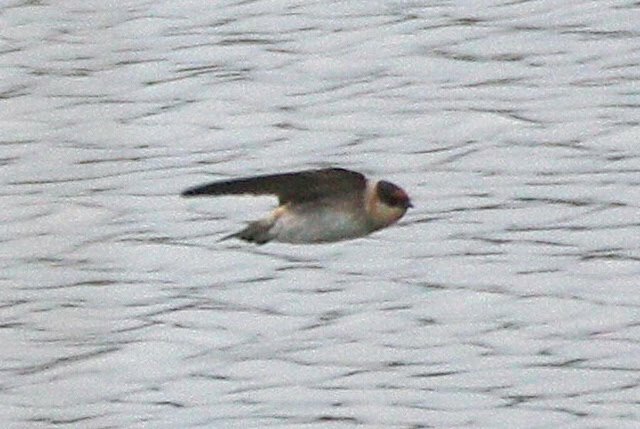 The first was an adult at Mill Pond, South Egremont, February 12–March 16 (ph. S. Carroll*, †M. Lynch*; 2010-08) and represented a first record for Berkshire. Another adult was found in Middlesex by David Sibley on October 20, 2010, and lingered until at least December 17, dividing its time between the fields off School Street in Acton, the correctional facility fields in Concord, and points in between (ph. K. Klasman, ph. D. Mitev, ph. E. Nielsen, ph. Pete Wrublewski; 2010-37). If any goose-loving birder ever has to do hard time, may he or she at least have the good fortune to do it near the Concord rotary! Stunning capture of a one-day wonder. Photo by M. Mastropasqua. For the second year in a row, John Hines pulled a male Tufted Duck out of the twisting stretch of the Sudbury River that crosses the Wayland/Sudbury line, Middlesex, near the bridges for Routes 20 and 27. In all likelihood the same bird as last year’s, this time the bird consorted mainly with a pair of Lesser Scaup (Aythya affinis) and stayed in the area February 3 through March 21, 2010 (ph. S. Mirick; 2010-21). A couple of major floods of the river made viewing difficult, if not impossible, for periods during the bird’s stay. Fortunately, when another male Tufted Duck visited the nearby Charles River in Waltham, Middlesex, with a trio of Lesser Scaup on February 19, 2010, the Sudbury bird had been seen just a few hours earlier, suggesting that the bird in Waltham was indeed a separate individual. The Waltham bird was a one-day wonder, but thankfully its finder, Michael Mastropasqua, captured some stunning images (ph. M. Mastropasqua*; 2010-22). Yet another long-lingering and likely returning male Tufted Duck at the James V. Turner Reservoir (mostly in Providence, Rhode Island) crossed the Massachusetts border into Seekonk, Bristol, December 3, 2009, and remained in the general area through March 16, 2010 (ph. M. Bornstein, ph. I. Davies, ph. E. LoPresti; 2009-51). 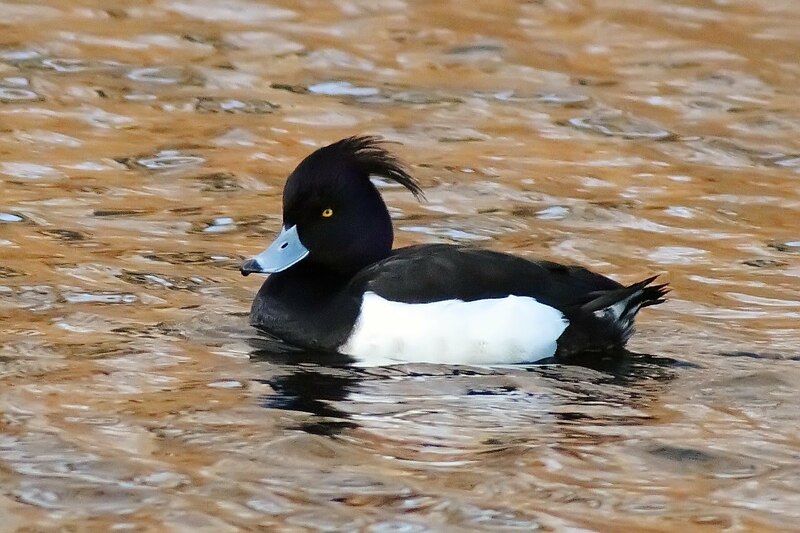 The Turner Reservoir had held a male Tufted Duck the prior winter as well, and nearby stretches of the Seekonk and Providence Rivers in Rhode Island have often held a male Tufted Duck in previous winters. While the wild provenance of Tufted Ducks generally is not questioned, there is, interestingly, supporting evidence that this area, particularly on the Rhode Island side, is a hotspot for other Old World visitors as well, including Common Black-headed Gull (Chroicocephalus ridibundus), Eurasian Wigeon (Anas penelope), and one apparent “Kamchatka” Mew Gull (Larus canus kamtschatschensis) (Rhode Island Avian Records Committee 2010). A fresh, basic-plumaged bird found off South Beach, Barnstable, September 18, 2010, was likely in its first summer or possibly its second (ph. †M. Iliff*). Although distant, the photos—combined with field notes—revealed the salient points for identification: a smallish loon with a smoothly rounded and somewhat puffy rear of the head, a perfectly straight juncture between white fore neck and dark hind neck, a rear hind neck that is only very slightly paler than other parts of the hind neck, a bill held horizontal during observation (Arctic Loon [Gavia arctica] holds bill above horizontal), flanks dark to waterline during entire observation, not thick-necked or large-billed like Arctic Loon, upperparts overall dark brown without edging or white squares, and small dagger-shaped bill. With this September report, Pacific Loon has now appeared in Massachusetts during all months, and Massachusetts birders should be on the lookout for it at just about any time of year. Although Pacific Loon has appeared in many Cape Cod locations, this appears to be the first record from well-watched South Beach. Don’t forget these dark-headed cuties like inland ponds as well as coastal waters. Photo by Jeremiah Trimble. 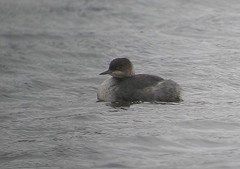 An Eared Grebe found by Mary Keleher on Mill Pond, Marstons Mills, Barnstable, January 2–3, 2010 (ph. v. M. Keleher*, ph. J, Trimble; 2010-01), serves as a good reminder that this species can occur on inland ponds as well as in coastal salt water and estuaries. So it pays to check your grebes carefully, especially in winter. One reported on the December 20, 2008, Buzzard’s Bay Christmas Count in a more traditional coastal location, Quissett Harbor, Falmouth, Barnstable, lingered until at least January 9, 2009 (ph. P. Trimble; 2009-45). Representing the first record for the United States and just the fourth live bird encountered (following three seen off Newfoundland in 2003), this image was taken during the first moments of observation of this bird, largely because of the pale wing flashes that indicated a possible Barolo Shearwater. It was not until several minutes later that the identification was arrived at, however, once Rick Heil was able to see the pale face in the field and the trip leaders were able to review the photos to confirm the identification. Key field marks visible here are the blackish upperparts (unlike Audubon’s Shearwater), white face with an isolated white eye (unlike Audubon’s or Manx), and diagnostic white tips to the greater and median secondary coverts, that set off a silvery flash in the midwing that is perhaps the easiest way to pick this species out in a quick or distant view. Photo by Marshall J. Iliff. Whatever you call it—Little Shearwater, Barolo Shearwater, Macaronesian Shearwater — it stands as the greatest of many highlights of the tremendously successful Brookline Bird Club pelagic trips organized by Ida Giriunas. Although the AOU still considers Little Shearwater to be a wide-ranging polytypic species occurring in the Pacific, Antarctic, Indian, and eastern Atlantic Oceans, most other taxonomic authorities split Little Shearwater into several species, which genetically are not necessarily closest relatives (Austin et al. 2004). In fact, the two North Atlantic taxa, baroli and boydi, are actually closer to Audubon’s Shearwater (Puffinus lherminieri) than to nominate Puffinus assimilis. Regardless of the species-level taxonomy, the bird found roughly 18 miles north of Veatch Canyon, Nantucket, August 25, 2007 (ph. J. Forbes, ph. †M. Iliff, ph. B. Nikula, ph. C. Pedro, ph. S. Spangenberg, ph. S. Surner, ph. J. Trimble; 2007-58) clearly represented baroli, which some authorities (e.g., Clements 2010, Robb et al. 2008) consider a monotypic species—Barolo Shearwater—while others (e.g., British Ornithological Union) merge it with boydi under Macaronesian Shearwater. The key identification points for this individual were a size much smaller than Manx (Puffinus puffinus) and somewhat smaller than Audubon’s; white undertail coverts; under wings extensively white with white extending to the remiges; upper parts blackish with pale silvery panels on greater coverts and white tips on median and greater secondary coverts, creating white wing bars; and face extensively white with prominent black eyes. Puffinus assimilis boydi is perhaps most similar, but differs in that it looks like a small Audubon’s Shearwater, with brownish upperparts, a dark face, and dark undertail coverts. Boyd’s Shearwater also lacks the pale silvery upper wing panels and white wing bars. The bird’s flight style did seem at odds with some descriptions in the literature, causing hesitancy among some observers, none of whom had previous experience with baroli. Its flight was rapid and low to the water, with long glides on bowed wings. The flaps were quick and hurried, but still showed significant bend at the wrist giving the impression of a larger bird. This did not seem to match the description of “alcid-like flight” sometimes provided (e.g., Finch et al. 1978). Fortunately, the great bird-dog captain Joe Huckemeyer of the Helen H was able to keep on the bird, enabling diagnostic photos and great views by all fortunate to be on board. This first record for Massachusetts was also just the second documented record for North America. The first was a lighthouse crash victim at Sable Island, Nova Scotia, September 1, 1896 (Dwight 1897, Tufts 1961) and definitely pertains to baroli (ph. J. R. Trimble, M. J. Iliff in litt.). A purported South Carolina specimen found on Sullivan’s Island, South Carolina, in late August 1883 has been reported as a Little Shearwater, probably baroli (Peters 1924, Post and Gauthreaux 1989), but when Trimble and Iliff examined the original specimen, it appeared to be an Audubon’s. Little Shearwaters may, indeed, be more regular in Northeastern waters than is known, as indicated by the only other credible records: sightings by Bruce Mactavish of a single bird approximately 80 kilometers southwest of Sable Island on September 23, 2003, and a pair approximately 80 kilometers south of Sable Island the following day (Mactavish 2004). Pelagic birders should keep a keen eye out for this taxon. Close, diagnostic photos of a gorgeous adult White-tailed Tropicbird from the north end of Welker Canyon on August 22, 2010, should whet the appetite of Bay State pelagic enthusiasts (ph. E. Savetsky*; 2010-19). Discounting records that do not rule out Red-billed (Phaethon aethereus), this is just the seventh record for Massachusetts and the third reviewed by MARC. All but one of the previous records deal with storm-related birds found moribund or seen from shore. 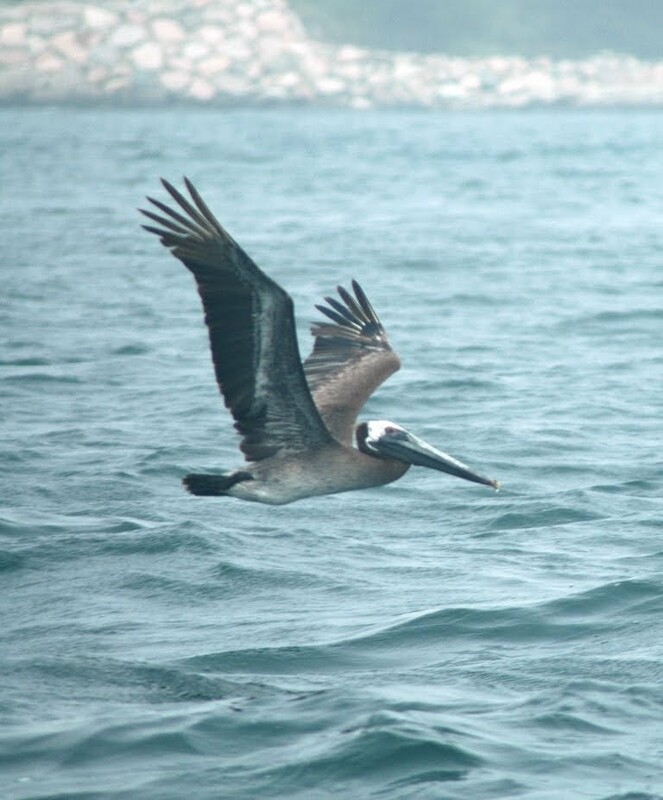 As with many pelagic birds, there are too many known unknowns to assess the regularity of its occurrence offshore in summer, but it is likely more regular than the few records would indicate. A lone bird harassed by Mute Swan parents (Cygnus olor) at Great Point, Nantucket, September 12–13, 2010, was found and photographed by Vince Calarco (ph. V. Calarco*; 2010-16). The pure orange yellow bill, narrow amount of bare skin around the eye, and very black and extensive dark primaries and secondaries eliminate the possibility that this was an escaped Old World pelican such as Great White Pelican (Pelecanus onocrotalus). A lone bird found and photographed by Rachel Farrell just northwest of the Wood’s Hole passage on Buzzard’s Bay, Barnstable August 5, 2010 (ph. R. Farrell*; 2010-31), was an adult or near adult, and thus was a different bird from the first-summer Brown Pelican photographed on August 10 at Stratford Point, Connecticut. A series of White-faced Ibis records from 2009 and 2010, well documented with photographs, raised issues for the committee only in terms of how many individual birds may have been present. In 2009 a White-faced Ibis was photographed on April 7 at Buttonwood Stables Farm off Route 133, Ipswich, Essex (ph. R. Heil*; 2009-52); later that year, one was photographed in high breeding plumage on May 19 at the large Glossy Ibis (Plegadis falcinellus) rookery at Kettle Island, Essex (†J. Berry*, ph. S. Perkins*; 2009-50). This last record raises the possibility of White-faced breeding in the state or pairing with local Glossy Ibis, which makes real the possibility of hybrids appearing in coastal Massachusetts. More White-faced Ibis were found in 2010, when two were photographed together along with a dozen Glossy Ibis on May 10 at Pikul’s Farm at the Rowley/Ipswich border, Essex (ph. †P. Brown; 2010-24). 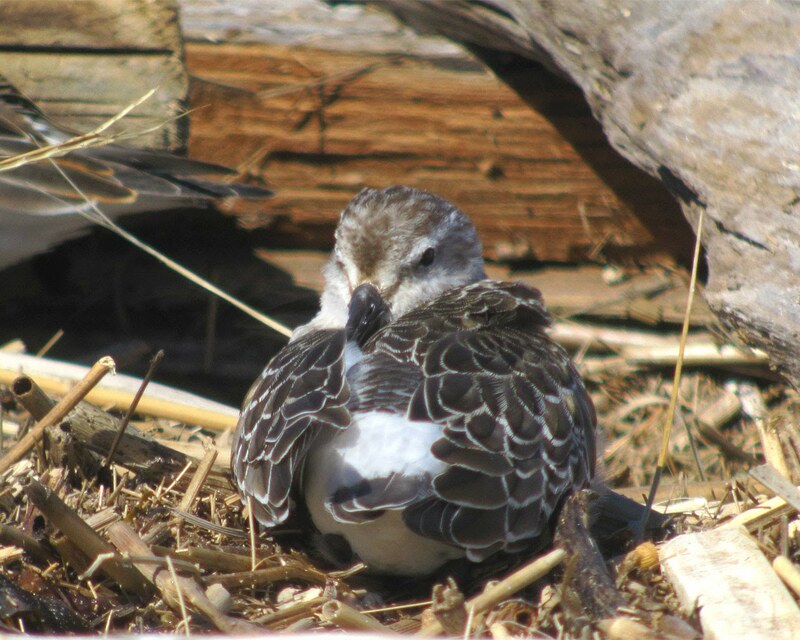 A bird similar to one of the Pikul’s birds, but with a more worn face pattern, was photographed later that year on June 6 at nearby Plum Island (ph. R. Heil*; 2010-25). This suggests that one of the birds may have been the same in both records, and, indeed, one of the 2010 White-faceds may have been the same bird as in one or both of the 2009 records, as all were from the same general area. 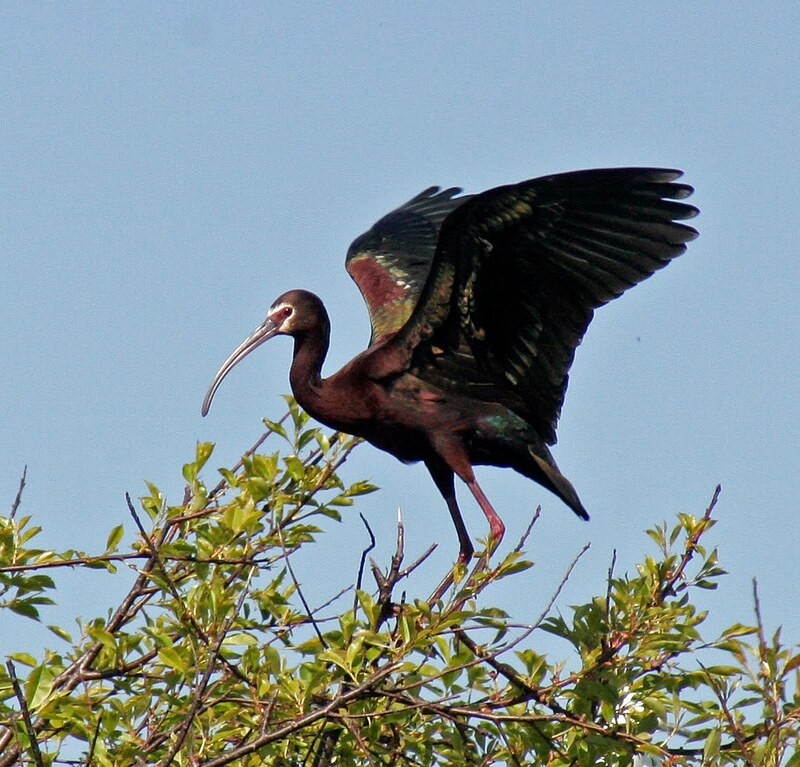 One committee member even speculated that, given the date shortly following the Plum Island record, a White-faced Ibis found and photographed by Vin Zollo on July 11, 2010, in Squantum, Norfolk, (ph. V. Zollo*; 2010-26) may have been the same bird, although another committee member felt that given the distance, the Squantum bird was more likely a different bird, one that perhaps was associated with a different Glossy Ibis rookery on the Boston Harbor Islands. Regardless, this record documents a new species for Norfolk. The committee has yet to fully address the complicated potential duplication among these records. Going forward, the bylaw changes discussed in the introduction will help the committee determine when records should be treated together as most likely pertaining to the same individual bird. A Great White Heron found and documented by Carolyn Longworth in the restored marsh along the hurricane barrier in Fairhaven, Bristol, lingered from July 9 through September 9, 2009 (ph. †C. Longworth*; 2009-16), and stirred much discussion among committee members. The record passed 7–1 on a second round of voting, with one member arguing that the criteria for eliminating a pure white Great Blue Heron (Ardea herodias herodias) were not sufficiently established and that a conservative approach was warranted. This point may be true given the Texas Bird Records Committee’s decision that the Great White Heron is merely a color morph and should not be reviewed by their records committee (Texas Bird Records Committee 2006). The TRBC decision was based largely on the discovery of two Great Blue Heron nests in Texas with both white and blue nestlings. The other committee members agreed that conclusively eliminating a pure white Great Blue Heron is difficult, with little to point to other than leg color (yellowish in Great White, grayish in Great Blue) and perhaps bill size (slightly larger in Great White, but probably useful only in direct comparison). Nonetheless, supporters pointed to the prevalence of summer and fall records in the Northeast, which parallel northward wanderings of other southeastern herons. They contrasted this with a lack of reports of white Great Blues in other seasons, which might be expected of a color morph of Great Blue. The committee also felt that until more information is gleaned about the occurrence of white Great Blue Herons, the right approach would be to treat the records as Great White Herons, which is consistent with how most other records committees have treated similar looking birds. Mitra and Fritz discuss the apparent pattern of vagrancy in their article on two New York records (2002). Although this Great White Heron, discovered by the photographer, was very well-documented and stayed for a long time for all to see between 9 July and 9 Sep 2009, it still generated some discussion in review. 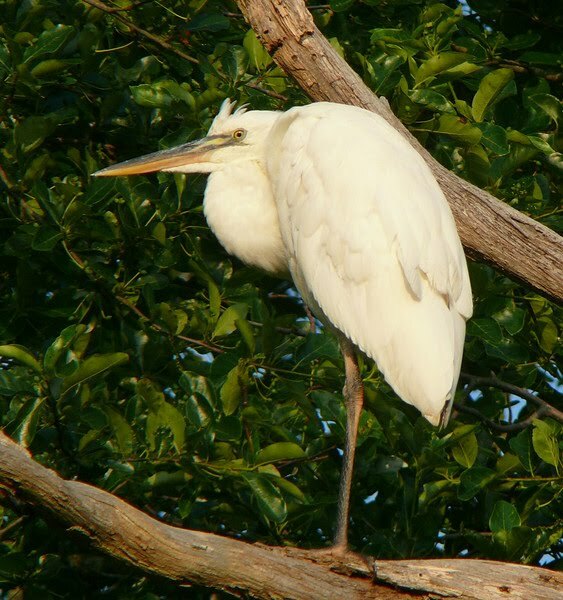 At question is whether leucistic or aberrant Great Blue Herons can ever be reliably separated from Great White Heron, the white subspecies from South Florida. Although some members still considered this an open question, the record was ultimately accepted. Photo by Carolyn Longworth. Kathleen Bartel’s description to an eBird reviewer of a Swallow-tailed Kite soaring near her house on Mount Terrydiddle, Rehoboth, Bristol, on April 29, 2010 (†K. Bartels*; 2010-10), convinced all but one committee member to accept the record, and it passed 8–1 on a second round vote. The majority pointed to certain details of this distinctive species in the description plus the sighting of a Swallow-tailed Kite days earlier in nearby Rhode Island. The lone dissenter felt that Osprey (Pandion haeliaetus) could be a trap for the unwary and that the description did not satisfactorily rule out this possibility. In-hand photos of an adult Broad-winged Hawk found struggling in a yard in Belchertown, Hampshire, on December 12, 2009, established a record late date for this species in Massachusetts (ph. S. Surner; 2009-44). The previous late date was November 18, 1959 (Veit and Petersen 1993). Although it was obviously not in the best of health, the bird showed no indication of prior captivity. Interestingly, Nova Scotia has at least two records of wintering Broad-wingeds, and New Brunswick and Connecticut have records as well; each of those records, however, pertains to a juvenile bird (Wheeler 2003). Found as the climactic end to a Massachusetts Big Day by Marshall Iliff and Jeremiah Trimble on May 31, 2010, near the North Pool Overlook at Plum Island, Essex (au. I. Davies, †M. J. Iliff*; 2010-20), no one actually saw these furtive birds, but scores heard their distinctive “kickee-doo” song, which made the birds twitchable even in daylight hours, but primarily in the evening. Many observers heard two birds, including on the last day they were reported, June 21. All committee members accepted the record of two Black Rails, but there was discussion of the proper date range for both, given that just one bird was initially reported on 31 May. The official submission, however, mentioned a probable second bird. The committee ultimately voted 8–0 to accept “up to 2 Black Rails for the period 31 May–21 June 2010.” This marks just the fifth Massachusetts record since 1955, the first since 1976, the first for well-watched Plum Island, and the first accepted by MARC. One of the two records of this thick-billed beachcomber from the south was Massachusetts’s earliest ever, a bird found on March 29, 2010, at Madeket, Nantucket (ph. Vern Laux; 2010-12). 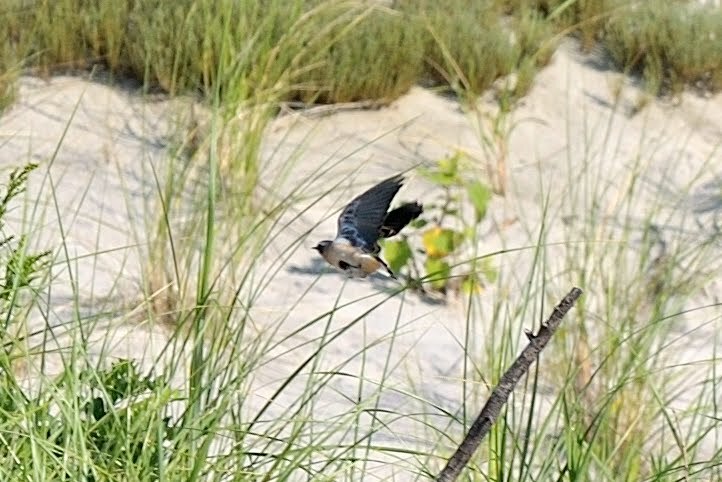 Another, found by Brian Harris on June 11, 2010, at South Beach, Barnstable, appeared to be a first-summer male given its worn coverts and moderately black breast band and face (ph. B. Harris*; 2010-14). 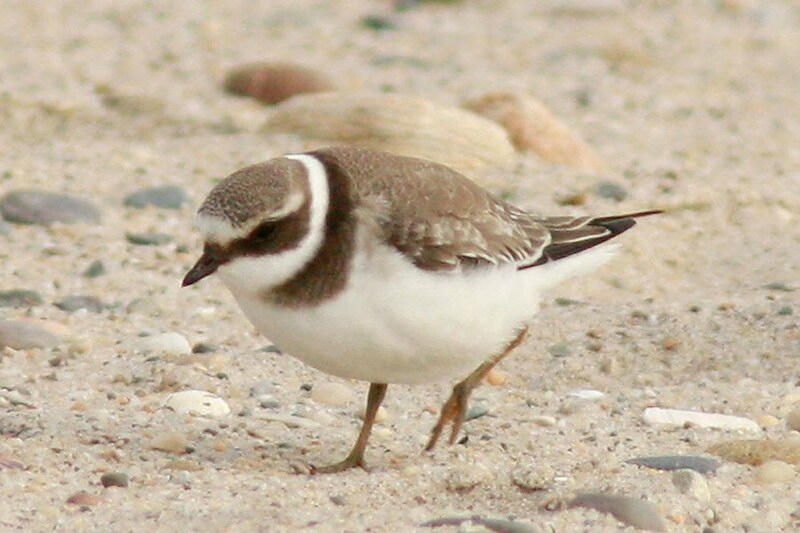 On September 11, 2010, during a walk down South Beach, Chatham, Barnstable, Blair Nikula identified the state’s second record of this partially unpalmated plover based on the calls it gave while flying by and a brief view of the bird on the ground. He recognized the bird later because its dorsal coloration was paler than that of a typical Semipalmated Plover (Charadrius semipalmatus) and devoted three hours to tracking and photographing it. When it finally called again, it confirmed his initial impression that the bird was indeed a juvenile Common Ringed Plover (ph. †B. Nikula*; 2010-29). Altogether, he gathered superb documentation that provided all the evidence essential to evaluating this difficult and extremely rare (but easily overlooked) species. Most saliently, photos show the following: diagnostic lack of toe webbing between the innermost toes; paler back than neighboring Semipalmated Plovers; lack of pale orbital ring; extensive pale forehead and eyebrow; dark face line meeting at the gape; extensive pale fringing on the crown; dark area meeting at the lores; somewhat thinner, more pointed bill; a broad, broken dark breast band; and the broad, extensive white wing stripe. While hardly any of these points alone would be diagnostic, in combination they paint a convincing portrait not replicated by Semipalmated. The clincher, of course, was the description of “a soft, two note call, slurring upward on the second note” and an aggressive “chuckle” call that was “softer and mellower” than those of the Semipalmated Plovers it was chasing. The first recorded sighting for Massachusetts was also a juvenile, picked out by call and photographed at nearby North Monomoy on September 5, 1990 (Veit & Petersen 1993; Petersen 1995). The only other records for the lower 48 states are Ninigret Flats, Charlestown, Rhode Island, September 15–22, 1991 (Field Notes of Rhode Island Birds 1991); South Lubec Flats, Maine, August 26–September 5, 2003 (Ellison and Martin 2004); and Jamaica Bay Wildlife Refuge, Queens, New York, September 13, 2005 (New York State Avian Records Committee 2008). Identification of Common Ringed Plover is one of the great challenges of shorebird identification in North America since Semipalmated Plover is so similar. Blair Nikula first picked out this juvenile on 11 Sep 2010 by its distinctive call, but then followed up to get photos showing the suite of field marks that observers should look for, including: paler back and upperparts; more pale fringing in the breastband and crown; more slender bill; dark face always meeting at the gape (not above as on most, but not all, Semipalmateds); and lack of toe palmations between the innermost toes (barely visible on right foot in this photo). Given the identification challenges, this species is likely more regular than Massachusetts’ two records would indicate. Photo by Blair Nikula. A majority of committee members felt that sightings from North and South Beach, Chatham, Barnstable, were of the same bird, so the committee decided to treat both as one record, although they were initially reviewed separately. The South Beach bird was seen on August 27–28, 2010 (ph. F. Grenon*, ph. D. Mitev, ph. E. Nielsen, †B. Zajda; 2010-15); the North Beach bird was first reported on North Beach Island by Brian Harrington on August 9 and seen again on North Beach on August 28 and September 5 (ph. †W. Petersen; 2010-32). Local shorebird experts (B. Harrington pers. comm., B. Nikula in comments) confirmed that godwits cover the roughly five-mile distance between these sites (and more) in their daily feeding movements in the Chatham area. These experts noted that the original location on North Beach Island was halfway between the locations of subsequent sightings on South Beach and North Beach, respectively. Given that just three of the 21 previous Massachusetts reports have pertained to the Siberian group (the majority of those identified to subspecies have pertained to the European L. l. lapponica), the odds certainly favor the two records pertaining to one individual. This bird was clearly a representative of the dark-rumped Siberian group, and photos of the underwings further showed the heavily barred axillars. The Committee did discuss subspecies ID and the apparently limited variability in the nominate form. However, the committee members felt that more information was needed on how to separate the Siberian and Alaskan baueri from menzbieri, which breeds in regions farther west in Russia and is somewhat intermediate between baueri and lapponica. Previous Massachusetts reports of the Siberian form hail from Monomoy, Barnstable July 31–August 13, 1988 (Veit & Petersen 1993), Katama, Dukes May 4, 2002 (V. Laux), and South Beach, Barnstable May 9, 2004 (B. Nikula); these records have yet to be reviewed by MARC. This adult Bar-tailed Godwit at South Beach spent about a month in the general area 9 Aug-5 Sep 2010. Bar-taield Gowdit is rare enough to start with, but the fact that this was one of the two Siberian subspecies (evidenced by the dark rump and dark axillars) made it even rarer, as Massachusetts has just three prior reports of that form for the state. Photo by Daniel Mitev. Blair Nikula was truly on fire in 2010, and he started the fall shorebird season off early with a Red-necked Stint on South Beach, Barnstable, that remained from June 27–July 1 (ph. A. Burdo, ph. I. Davies, ph. L. Seitz, ph. †B. Nikula*, ph. R. Schain; 2010-30). The wings and back seemed to have a mix of relatively fresh alternate feathers and worn basic-type feathers, suggesting the bird was a first alternate male. Its bright coloration resembled that of breeding-plumaged Sanderlings (Calidris alba), a resemblance that apparently caused some confusion to eager twitchers. 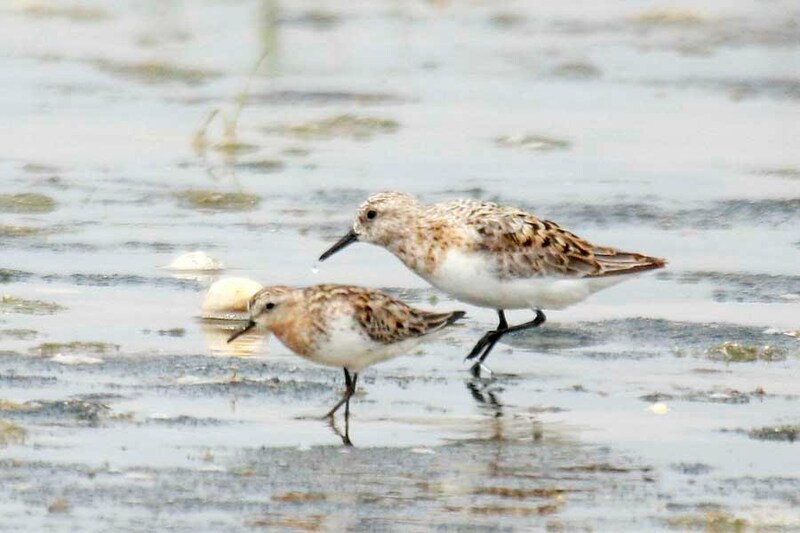 Birders should be cautious with stint identifications and always take care to specifically eliminate Sanderling. We also suggest that birders continue to document birds like this through the length of their stay so that accurate date ranges can be established. None of Massachusetts’s twelve recorded Red-necked Stints have been documented to remain for a week. Half of the records are from June through mid-July, a reminder to shorebird enthusiasts to get out there with the summer crowds and hit the beach. Mother and baby? Reports of stints–both Red-necked and Little–should always take care to eliminate the very similar Sanderling, and this photo illustrates why. When they are side-by-side the size differences are obvious, but loners are very tough to separate. In general, Red-necked Stints, like this early adult on 27 June that occurred in a year with widespread shorebird nest failures, have brighter reddish throats, finer and shorter bills, and more streaking below the throat. But most important is to accurately assess the size (Red-necked close to Semipalmated Sandpiper, Sanderling close to Ruddy Turnstone). A final clue can come from the presence or absence of a hind toe. Most Sanderlings lack a hind toe (as in this photo), while all small peeps have a hind toe. Photo by Blair Nikula. Two sightings of an adult Sharp-tailed Sandpiper, one by Brian Harrington on October 3, 2010, on “Minimoy” and the other across the water at South Beach, Chatham, Barnstable, by Daniel Mitev on October 9 (ph. D. Mitev; 2010-35), established only the fourth record of this species in Massachusetts and the first since 1989. The only other adult was at Plymouth Beach on June 30, 1971 (Veit & Petersen 1993; Rines 2009; 1971-02). Perhaps the best of an unusual diversity of Asian shorebirds in fall 2010 was this worn adult Sharp-tailed Sandpiper at South Beach on 9 Oct 2010. This represented not only the gourth record for Massachusetts, but a very late date for an adult. In this image, the bright rufous cap, orangeish breast with dark chevrons, and hint of a complete white eye ring are visible and distinguish this bird from Pectoral Sandpiper, which would be expected to show a darker streaked chest and a pale base to the bill. Photo by Daniel Mitev. A Curlew Sandpiper at Sandy Point, Plum Island, Essex, represents only the third juvenile record in Massachusetts and also stands as the Commonwealth’s latest record. Found by Suzanne Sullivan on October 8, 2010, it remained through the 28th, during which time it afforded scores of birders a chance to observe it up close and to capture stunning photos and videos. These included pictures of the long-billed beauty plucking large worms from the sand (ph. T. Bradford, ph. v. P. Brown, ph. R. Heil, ph. E. Nielsen, ph. S. Sullivan*; 2010-36). Neither of the previous records of juveniles—one in Ipswich September 21–22, 1985, and the other at Squantum September 5–20, 1991—have been reviewed by MARC (Veit & Petersen 1993). Suzanne Sullivan works the shorebirds hard at Sandy Point and this Curlew Sandpiper was one of her prizes. Juveniles are much rarer than adults in Massachusetts, but not particularly hard o separate from the otherwise similar Dunlin since they have such lovely crisp, white fringing on the back and scapulars. Of course, then they show off the white rump, identification is even easier. In this image, the pattern of the back and scapulars is quite different from White-rumped Sandpiper, which would have rufous and blackish centered feathers in this same region. Photo by Suzanne Sullivan. After Massachusetts’s first two records since 1985—the second and third records of adults ever—were reported in January 2009, two more adults were found in January 2010. One spent January 14–17 at Race Point, Provincetown, Barnstable (ph. B. Porter, ph. B. Nikula, ph. J. P. Smith; 2010-06). The other stayed briefly at Richmond’s Pond, Westport, Bristol, on January 23 (ph. H. Zimerlin*; 2010-05). Although the reports possibly related to the same bird, the photos of the Westport bird were too distant to compare details like bill markings. However, reports from Quicksand Pond, Little Compton, Newport, Rhode Island, on the evening of January 23, and a subsequent Rhode Island report on January 27 from Easton’s Pond, Middletown, Newport, likely pertained to the Westport bird moving west (note that the Quicksand Pond bird was photographed on the Massachusetts side of the line as well). The Commonwealth now has 14 records of this pack-ice specialist. 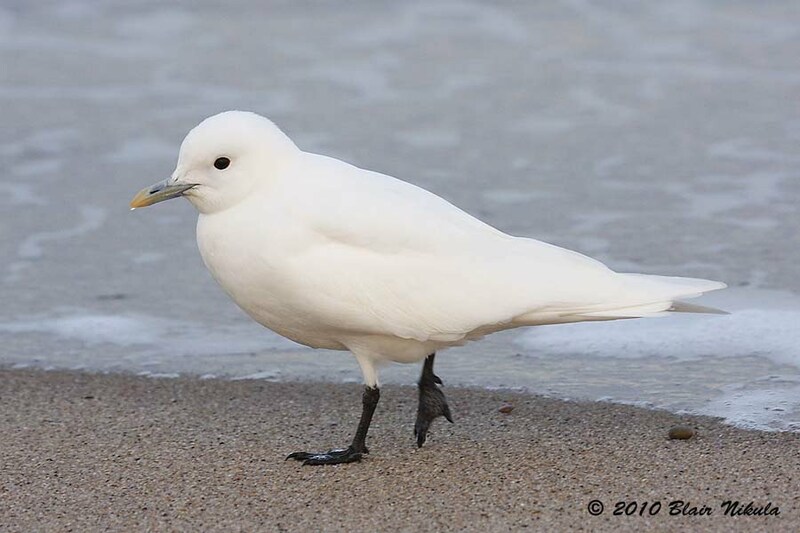 Although the beautiful birds are certainly welcome on our shores, there is some concern that the spate of recent records, and the high ratio of adults to immatures, may be reflective of problems Ivory Gulls are facing in the Arctic, where global warming has impacted the extent and distribution of sea ice. Those strong ice-grabbing feet seem eerily out of place on the Cape Cod sand. Photo by Blair Nikula. Commonly known in U.S. birding circles as the “bird of the century”—in the century in which birding took off as a popular hobby, no less—the first record of this pink-bellied arctic visitor to the lower 48 states drew birders by the hundreds to Newburyport Harbor, Essex, once news of its presence was made known on March 2, 1975 (ph. K. Able, ph. P. Alden, ph. P. & F. Buckley; 1974-02). It turns out the bird was actually originally seen on December 7, 1974, and January 12, 1975, but, as described by Miliotis & Buckley (1975), the initial finders were understandably incredulous of their own observations and awaited confirmation of their sighting before going public. Once word got out, the birding world was never the same—birders got a sense of just how many fellow feather-enthusiasts there were when they found themselves amongst droves gawking at the Ross’s. One committee member recalls seeing then Secretary of Defense James Slessinger jump from his car to spot the bird, accompanied by a security detail. It was Roger Tory Peterson’s 668th bird for the U.S. and Canada. While most birders stayed respectfully distant, a cameraman for the Channel 7 News approached close, rewarding viewers of that night’s broadcast with a rare opportunity to truly appreciate the bird’s pink blush. The bird that changed birding remained in the area until May 6, 1975. Ross’s Gull has been seen three subsequent times in the Commonwealth, sightings yet to be treated by the MARC. It is now known to breed sparingly in Canada and to rarely but regularly show up across the United States, even as far south as the Salton Sea in California (McCaskie & Garrett 2006). A bird described from Sandy Point, Plum Island, Essex, May 23, 2010 (†J. Nelson*; 2010-34), took two rounds of voting before all members were convinced to accept it, given the very early date. Although this bird is expected more often in summer and early fall, the May date was not unprecedented; there are three previous records in that month (Veit & Petersen 1993). Of the 28 records of White-winged Dove in Massachusetts, four are treated in this report and at least one additional 2010 record will be reviewed shortly. While an increase in feeders and improved communication of rare bird sightings may play a role in the recent increase of records, no doubt the numbers are primarily reflective of an actual increase in eastbound White-winged Doves as part of the species’ overall population boom and expansion. 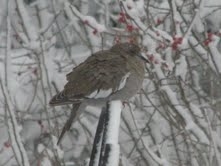 Three records were of feeder birds: one in Old Sturbridge Village, Sturbridge, Worcester, December 14, 2009–January 21, 2010 (ph. M. Szantyr; 2009-40); one in Ellisville, Plymouth, December 20, 2009 (ph. C. Goldthwaite*; 2009-41); and one in Chatham, Barnstable, January 8, 2010 (ph. B. Fletcher*; 2010-03). 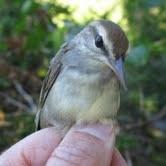 The one bird “in the wild” was an adult at the Eastham Stump Dump, Eastham, Barnstable, September 25, 2009 (ph. M. Faherty*; 2009-42). On October 30, 2010, Lanny McDowell found and superbly photographed a Say’s Phoebe at Gay Head Cliffs, Aquinnah, Dukes (ph. L. McDowell*; 2010-38). The reasonably broad buffy wingbars age the bird as a juvenile, confirming that it was not the same bird that popped in on the Vineyard the prior September. Island vagrants don’t like being told “no.” Photo by Lanny McDowell. Brian Tucker found a Bell’s Vireo at the Nahant Stump Dump and Heritage Trail, Nahant, Essex, October 17, 2010, and it was seen briefly the following day as well (ph. M. Goetschkes; 2010-39). Photos indicated the bright yellow tones, greener back, and shorter tail of the eastern subspecies, V. b. belli. This is just the fourth state record of Bell’s Vireo in Massachusetts; two were birds banded at Manomet, Plymouth, October 24–26, 2005 (2005-32), and September 8, 2006 (2006-22), and one was a crowd-pleaser at Falmouth, Barnstable, November 25–December 16, 2006 (2006-43). 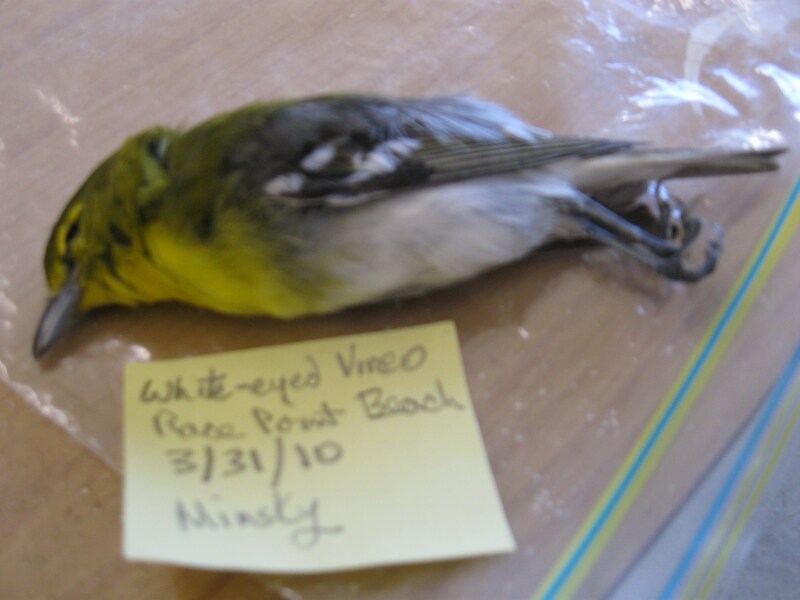 A Yellow-throated Vireo was found dead in the wrack line at Race Point, Barnstable, on the record early date of March 31, 2010 (ph. D. Minsky, specimen to Museum of Comparative Zoology, Harvard University; 2010-23). The strong southerlies around this time were conducive to early migration, but this record seems particularly early and should give some pause to those quick to dismiss April—or now March!—reports of Yellow-throated Vireos as misidentified Pine Warblers (Dendroica pinus). Don’t mind the label, this early Yellow-throated Vireo should give pause to folks assuming all yellow-throated, green-backed songbirds in early spring are Pine Warblers. Photo by D. Minsky. The one visiting Capaum Pond, Nantucket, May 12–13, 2010, was significant as Massachusetts’s first spring record (ph. V. Laux; 2010-11). Several members agreed that it appeared to be of the expanding southwestern race P. f. pelodoma. Prior to this, the only spring records this far north and east were of Caribbean P. f. fulva (or P. f. cavicola) from Nova Scotia (Tufts 1961). The recent population growth and expansion of Cave Swallows in Texas probably portends more spring records. The pattern is still not clear, however, so even though Cave Swallows were taken off MARC’s review list effective January 1, 2011, we will continue to review spring records, just as we normally review particularly unseasonable records. Photo by E. Vernon Laux. A Northern Wheatear was quite a find during an August 26, 2009, beach walk at Crane Beach, Essex (ph. D. B. Jones *; 2009-48). Fantastic flight shots captured perfectly the T-shaped tail pattern that separates Northern from many other wheatears. The bird was an adult male (perhaps explaining the early date). It was somewhat buffy on the undertail coverts and almost certainly of the Greenland subspecies O. o. leucorhoa. Photo by D. B. Jones. 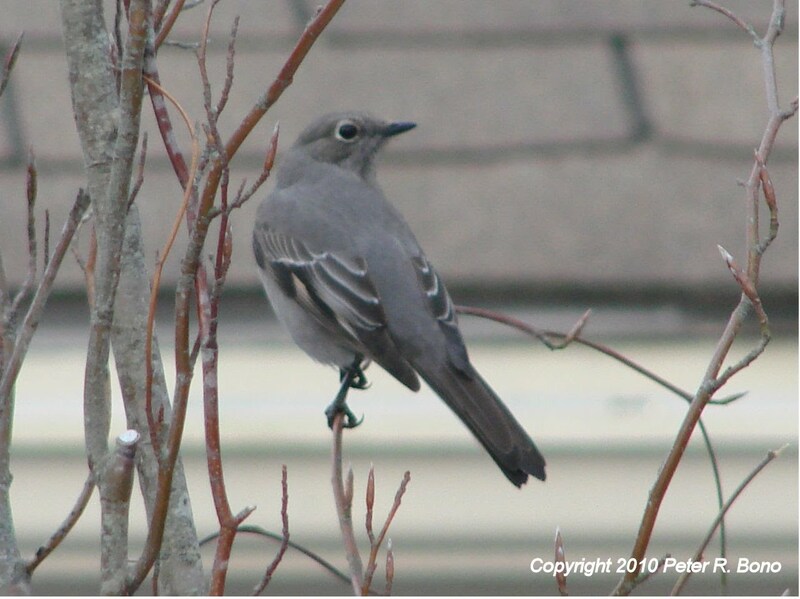 Fortunately the Townsend’s Solitaire that spent January 12 through February 4, 2010, in a residential area of Yarmouthport, Barnstable, chose to frequent the yard of Peter Bono, who captured diagnostic photos and video of this delicate charmer (ph. v. P. Bono*; 2010-07). Only four of the state’s 16 records pre-date 1993; none of those older records have been reviewed by MARC. 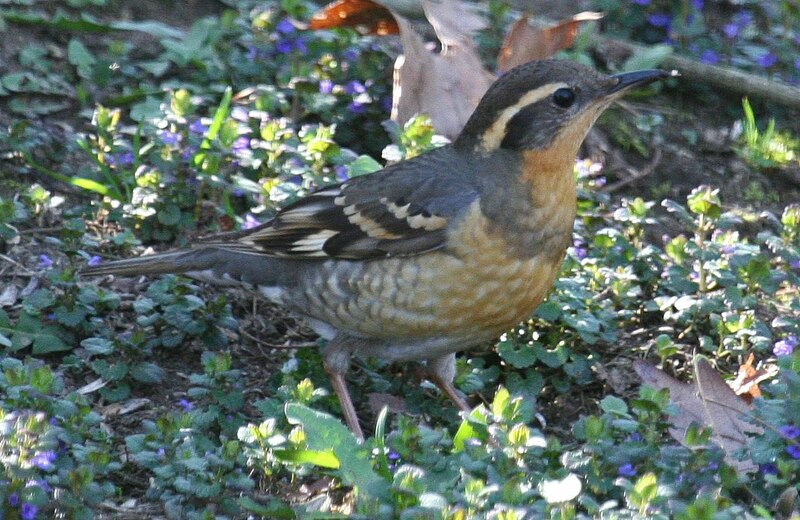 A female at a feeder in Palmer, Hampden, April 24–May 1, 2009, was the first Varied Thrush to linger in Massachusetts into May (ph. J. & K. Athearn*, ph. †S. Surner; 2009-46). One found by Brian Parker on January 11, 2010, at Salisbury State Park, Salisbury, Essex, remained until March 28 (although it went unrecorded from February 7 through March 17). It was remarkably cooperative—at least at times—posing for stunning pictures and delighting scores of birders (ph. R. Heil, ph. V. Laux, †B. Parker*, ph. S. Selesky; 2010-04). The January date of its discovery led some committee members to speculate that the bird may have arrived somewhere in the area earlier and remained undetected. This record marks only the third for the state (the second accepted by MARC), and the only record outside of the expected late October–early November time frame. 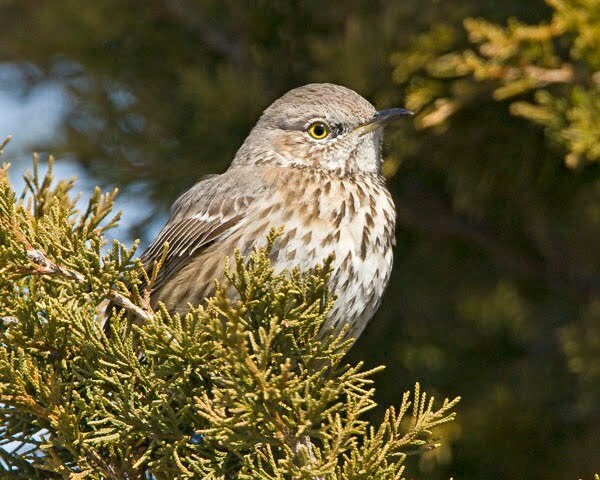 Sage Thrasher is one of those birds that occurs so rarely as a vagrant that most birders an only dream of finding one. Brian Parker was lucky enough to find Massachusetts’ third record and one of the only East Coast records outside of a somewhat narrow October to November time frame. Impressively, this bird lingered until late March, although it was not seen continuously during its stay. Photo by Sandy Selesky. Two Black-throated Gray Warblers were accepted, including an immature male/adult female photographed on September 11, 2010, in the junipers at Gay Head, Dukes (ph. L. McDowell*, ph. S. Whiting*; 2010-17), and a male of unknown age described from the Middlesex Fells, Middlesex, on September 27, 2010 (†T. Pirro*; 2010-27). Although both birds were searched for on the following day, both were one-day wonders. 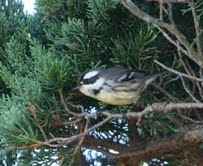 The Vineyard bird was the second for Dukes, with the previous bird present at Vineyard Haven December 14–30, 1996 (1996-24). The Middlesex Fells bird was the third from that area, as Winchester has previous records from November 20–30, 1962, and October 11, 1970, neither of which have been reviewed by MARC (Veit & Petersen 1993). “Seriously, a Kirtland’s Warbler in Boston, almost 100 years ago?” That’s what ran through most committee members’ minds when presented with this record, until they read the careful description by Julia Sherman in a letter to Charles Maynard published in Records of Walks and Talks with Nature (Sherman 1917). The letter described a sighting by Sherman, her daughter Catherine, and Mrs. Hodgskins—all three top students of Maynard’s Saturday Bird Class—on May 26, 1916, in Roslindale, Suffolk (1916-02). The write-up was a brilliant example of what many today lament as a lost art (one that we photo-hungry MARC members are probably guilty of not nurturing enough! ), the ability to accurately, honestly, and comprehensively describe a bird sighting, with acute observations spanning from feather details to descriptions of size and behavior. The first thing Mrs. Sherman mentioned was the large size, and Kirtland’s are indeed giants of the Parulidae. She then described key plumage details, which she was able to observe by getting within three feet of the bird. Most significantly, she described a “clean cut” bird with a white eye ring “bisected by a black line,” black and gray on the side of the head and cheek (indicating a male), a slight brownish cast to the back (suggesting a first spring male, the most likely candidate for vagrancy), black lines on the back and flanks, pale canary yellow belly fading to white undertail coverts, white spots on the ends of the outer tail feathers, and “dingy white” edged wing feathers, forming more linear stripes (a particularly subtle detail that lends credibility to the whole report). Finally, Mrs. Sherman described the behavior, which was a critical selling point for many members. The bird was seen feeding low and often on the ground. While any warbler can feed on the ground, few do it consistently over prolonged observation. Even better, she was struck by the bird’s persistent tail wagging. Three warblers (or four, but western Nashville [Oreothlypis ruficapilla ridgwayi] has more of a tail flick) persistently wag their tails: Palm (Dendroica palmarum), Prairie (Dendroica discolor), and Kirtland’s. Nothing in the description suggests the bird was a Palm or Prairie. Although no one suggested Mrs. Sherman would have faked the report, committee members found the description particularly compelling because few of the details, particularly with respect to behavior, would have been available in published sources at the time. Troubling to committee members was the low population of Kirtland’s Warblers overall and the paucity of records off the path of their migration between Michigan and the Bahamas. Committee members noted, however, that the population was likely much greater in 1916 than it is today, and certainly higher than it was during the population crash of the 1940s, which reached its nadir in the 1970s. In the early 20th century, in fact, the species’ range included Ontario. Moreover, there is some precedent for vagrancy, albeit very little. A Kirtland’s Warbler has been found in Bermuda in winter, and, most importantly, one was found and photographed by Trevor Persons on June 2, 2008 in Kennebunk Plains, York, Maine (Persens & Petrucha 2009). This was the record that spurred review of the Massachusetts bird and, especially considering the similar date, probably tipped the scales for accepting the Roslindale bird. (And in fact it was the Maine sighting that led Persons to dig up Sherman’s letter and call it to our attention!) On a third round vote, one committee member maintained that such an unprecedented record by observers who were not familiar with this species needed more evidence, but the record still passed 7–1. Massachusetts’s fourth Swainson’s Warbler, and the second for Barnstable, was a hatch-year bird (aged by skull ossification) that blundered into the nets at Wing Island, Brewster, on both September 6 and 10 (ph. Sue Finnegan; 2010-18). 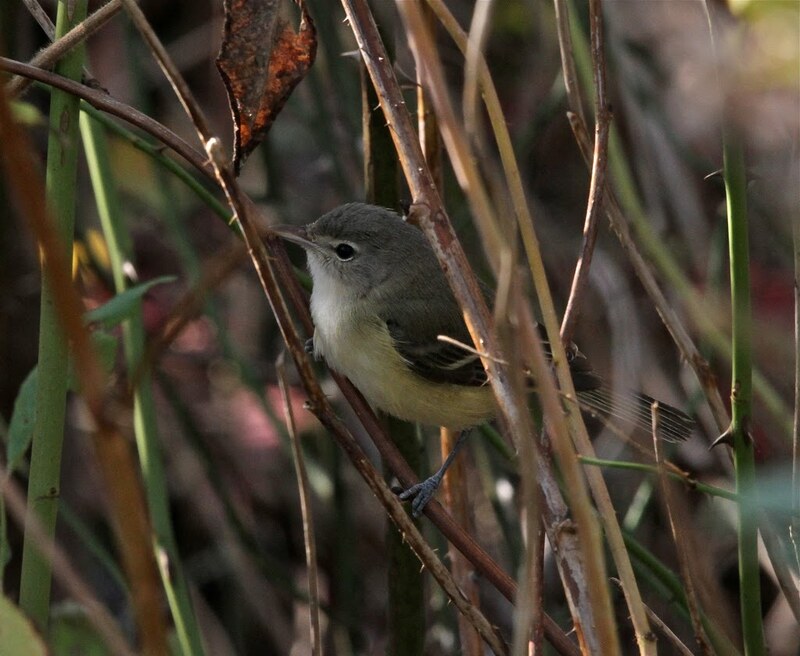 The fact that the bird could not be relocated by chasers between its two capture dates and the fact that half of Massachusetts’s four records have been mist-netted birds, make it clear that some Swainson’s Warblers surely are being overlooked. Check out that honker! Photo by Sue Finnegan. A rare and typically very early fall migrant, the one found by Don Wilkinson in the Boston Public Garden, Boston, Suffolk, October 1–4, 2002, marks the state’s latest record by almost three weeks and only the second record after August. The bird put on a great show, allowing for diagnostic photos (ph. G. Tepke, †J. Trimble; 2002-48). A September 21, 2010, fallout (*note: erroneously published in Bird Observer as September 12) on North Beach, Chatham, Barnstable, following a light northwest wind was made even sweeter for Carl Goodrich and Wayne Petersen when they discovered this bull-headed, white-winged prairie sparrow in beachside scrub, one of its favorite habitats when on the East Coast (†W. Petersen*; 2010-33). The main dike cutting through Great Meadows NWR, Concord, Middlesex, served as Ammodramus Alley during the last week of October 2010, hosting a Grasshopper (Ammodramus savannarum), a Nelson’s (A. nelsoni), and, on October 26, a Le Conte’s Sparrow (ph. R. Stymeist*; 2010-40). Although superb photos revealed no juvenal feathers on the LeConte’s, the bird’s age is uncertain because some hatch-years can acquire full adult plumage by this date. Le Conte’s don’t usually go so far out of their way to identify themselves! Photo by Robert Stymeist. One visiting a feeding station near Look’s Pond, West Tisbury, Dukes, April 25–30, 2010 (†W. Manter, ph. N. Shaw Cramer*; 2010-09), marked the second spring record since 1979—the other visited a Truro, Barnstable, feeder on May 22, 1999 (Bird Observer, 27 (5): 288)—and the Vineyard’s first ever at that season. 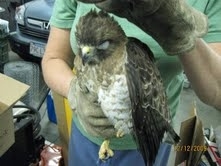 Photos indicate the bird was a first-spring male, based on its brown wings, lack of solid back, and reduced red on head. 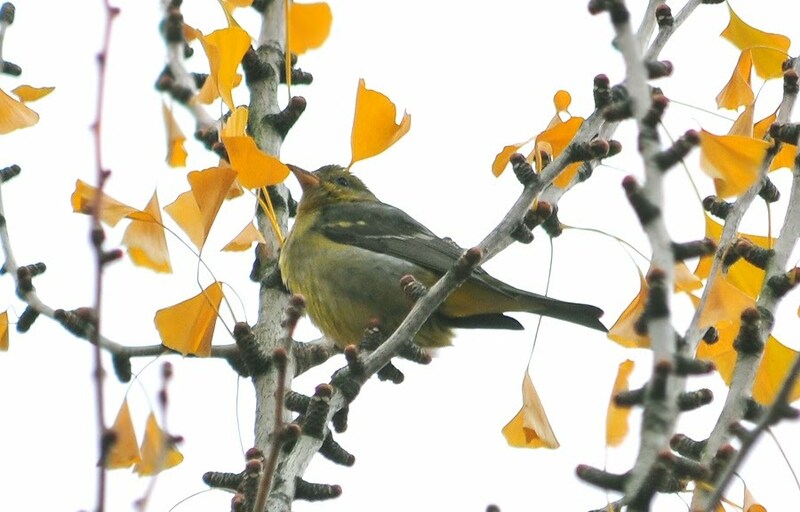 A female found by Tim Factor high in the weeping willows at the Boston Public Garden, Boston, Suffolk, December 13–15, 2009, was seen on a more typical date and marked a first record for Suffolk (ph. R. Stymeist, ph. J. Trimble; 2009-43). Western bird, Far-Eastern Tree, welcome to the BPG. Two records from East Orleans, Barnstable, raised same bird issues for the committee and helped lead to the bylaw changes described in the introduction concerning the treatment of records pertaining to one or more birds. One female/immature male had a long stay at a feeder at Harborview Lane, East Orleans, Barnstable, December 7, 2009–January 16, 2010 (ph. M. Faherty; 2009-39), but many birders had to wait between appearances. On one of the days it was seen on Harborview Lane, December 13, 2009, Glenn d’Entremont described a brief encounter with a female/immature male about two miles away on Briar Spring Road, East Orleans, Barnstable (†G. d’Entremont*; 2009-47). Although little is known about the size of the suburban wintering territories of Painted Buntings, most committee members felt it was better to treat the two as separate records, given the distance between sites. Another Painted Bunting visited a feeder at East Falmouth, Barnstable, on January 5, 2010, farther west on the Cape. 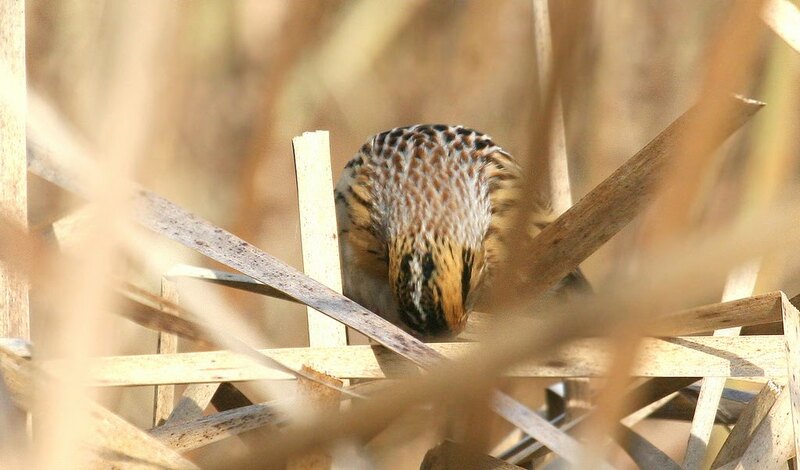 Photos revealed the male or female to be in its second year based on the contrast between its dull primary coverts and bright green primary covert edges (ph. J. and T. Brady*; 2010-02). 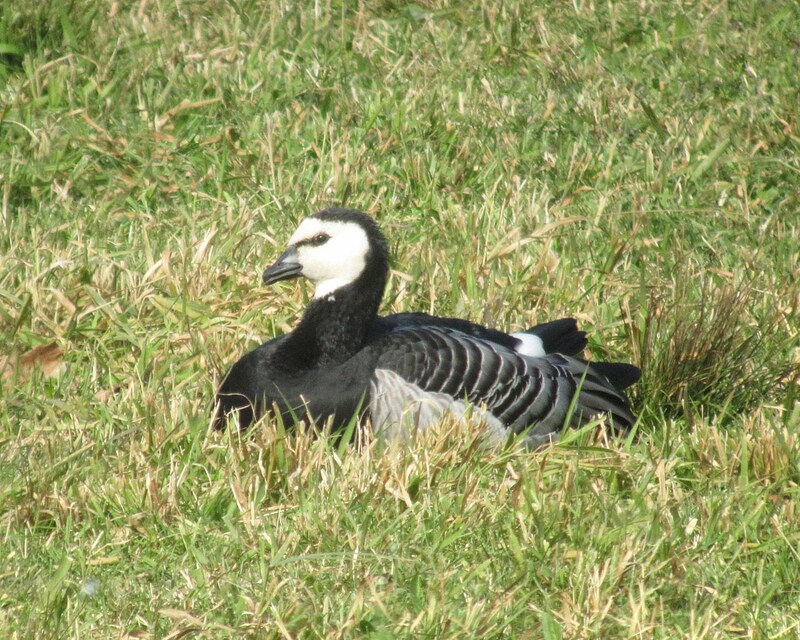 One adult photographed at Morning Glory Farm, Edgartown, Dukes, October 20, 2009, caused a stir until it was revealed that a nearby aviculturist had one Barnacle Goose missing (2009-37). While the MARC considers most Barnacle Geese in Massachusetts to be wild vagrants, eight committee members voted to reject the record based on the fairly early date, island presence and, most importantly, the nearby escapee. The incident served as a useful reminder that Barnacle Geese are kept in captivity and merit caution in certain circumstances. Nonetheless, noted the lone committee dissenter who voted to accept the record on its second ballot, the burden of proof should fall on those claiming a domestic provenance. More than other European geese, Barnacle Geese have undergone a massive population increase, due partly to increased survival of birds wintering in beet fields, plus probably a climate change effect. See also Accepted Records. One that spent December 6–7, 2009 along the tide line in Nahant/Lynn/Swampscott, Essex (†M. Iliff, ph. D. Jones, †J. Malone*; 2009-38) proved the most controversial bird in this report. Identification of this first-winter bird (presumably male) was not controversial; the issue was provenance. Those supporting natural vagrancy argued that the date, age, and habitat (a coastal estuary near human habitation) were consistent with a wild bird, and they noted that a presumed vagrant first-winter female had been photographed in St. John’s, Newfoundland, on November 17, 2009. The two dissenters argued that a pattern of natural vagrancy in eastern North America had not yet been established and voted to reject the record on the grounds that natural occurrence was questionable. They indicated, however, that they’d be willing to revisit the record in the future if evidence of natural vagrancy to the Northeast coast emerges. The record failed on its third ballot, 6–2. An earlier record, an adult photographed at Bass River, Dennis, Barnstable, January 24, 2004 (ph. B. Nikula*; 2004-43), went two rounds, failing 4–5 on the second. The Dennis bird mustered less support than the Nahant/Lynn/Swampscott one because it hadn’t been tracked as closely (so could have been or remained in the area awhile) and because it was an adult (unlike geese and swans, vagrant ducks are more likely to be young birds). In addition, the European population was more modest in 2004. 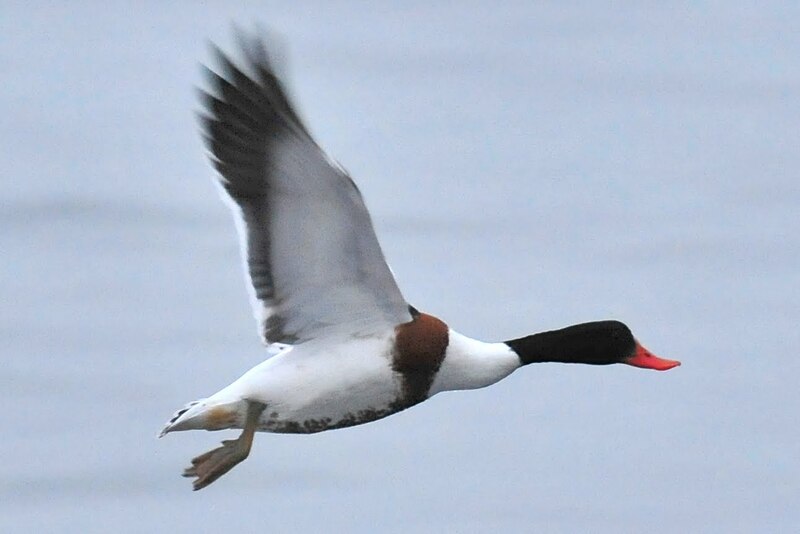 Common Shelduck is still not accepted to any state or province in North America and is not on the official ABA or AOU lists for North America. This juvenile (aged by the nice white fringe to the secondaries, among other features) was present in the Lynn/Swmpscott area for two days 6-7 Dec 2009. Although it was ultimately not accepted on the grounds of questionable provenance, some members made empassioned arguments, citing their recent increase in Iceland, the age of the bird, and a record from Newfoundland in early November 2009. Photo by David Jones. The committee revisited a previously accepted record of a Pterodoma, photographed at the southwest corner of Stellwagen Bank, Barnstable, April 22, 1991 (ph. 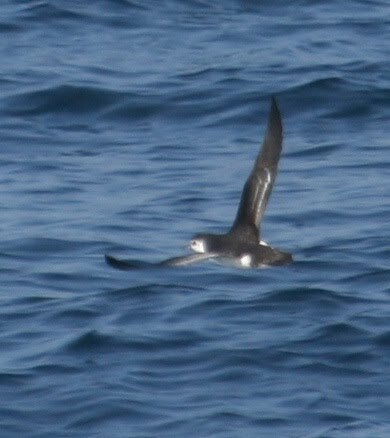 S. Highley*; 1991-01), and initially identified and accepted by MARC as a Black-capped Petrel. Reexamination of the photos in light of recent advances in petrel identification and knowledge of their distribution convinced all nine committee members on the second ballot that Bermuda Petrel (also known as Cahow; Pterodroma cahow) could not be eliminated. Further voting will be conducted to determine if the record can be accepted as a Bermuda Petrel or as a Bermuda/Black-capped Petrel. Stay tuned! An intriguing report of an albatross being chased by gulls near Lynn Beach, Essex, June 27, 2010, ultimately lacked sufficient details to convince enough committee members and failed 2–7 on a second-round ballot. 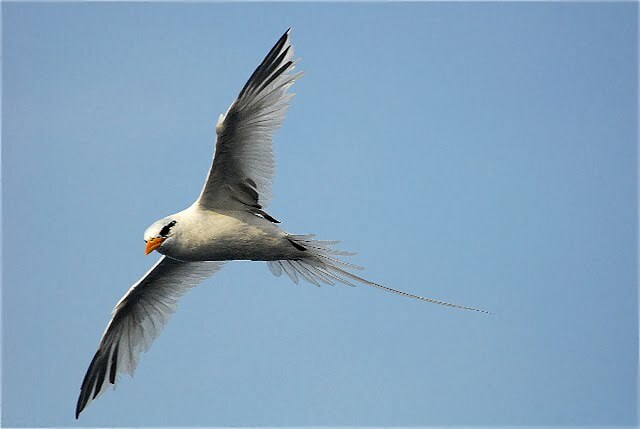 The minority of committee members in support noted the described actions seemed consistent with other recent Massachusetts albatross records—a bird hugging the coast and getting mobbed by gulls in the process. Few other birds draw such a Hitchcockian reaction. A report of three adult White Ibis seen by two observers while they were crossing the Bourne Bridge over the Cape Cod Canal, Barnstable, September 5, 1998 (1998-32), was submitted from memory in 2010. Records based solely on submissions written after the fact are difficult for the Committee. Here the twelve-year gap between the sighting and the write-up, combined with the rarity of three adult White Ibis in New England (most New England records pertain to lone immatures), and questions as to how long the birds possibly could have been in view (even granting it was the Saturday of Labor Day weekend! ), were the reasons provided by the three detractors. The majority of the Committee supported the record due to the strength of the described field marks, the observers’ experience with the species, and the relative distinctiveness of the species. Even though it failed 5–3, this submission was a good indication of the usefulness of eBird in drumming up unusual records. It was only upon entering the report into eBird that the finder was prompted to submit details. 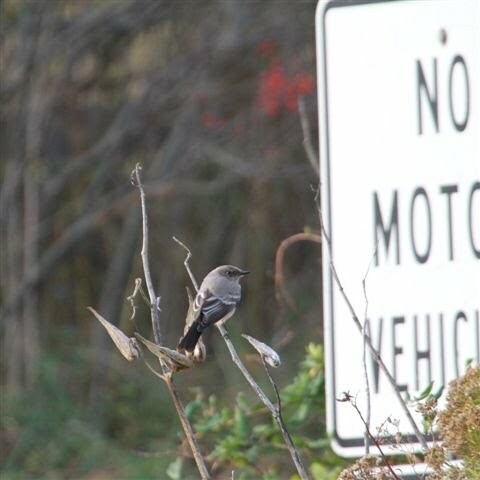 A report of Western Wood-Pewee seen, photographed, and heard giving a few calls among the net lanes at Manomet Center for Conservation Science, Plymouth, September 25, 2009 (2009-49), was unanimously rejected on the second round. Although some characteristics (e.g., dark mandible, dusky spots on undertail coverts) were suggestive of Western Wood-Pewee, some Committee members felt the very white-breasted appearance better matched Eastern Wood-Pewee (Contopus virens). The short call notes heard by the observers were intriguing, but it is generally extremely difficult to register and describe such brief sounds. The committee was concerned, especially, with the great variation in Eastern Wood-Pewee calls and the scant knowledge of the exact range of such variation. Old specimens purported to pertain to Western Wood-Pewee and discussed by Veit and Petersen (1993) were destroyed by beetles and cannot be verified (Rines 2008), so the species remains without an accepted state record. Although the species has been intermittently reported in the East in fall, most records lack truly convincing documentation; documenting Western Wood-Pewee in Massachusetts may require a specimen or diagnostic voice recording. An Ash-throated Flycatcher reported from South Monomoy Island, Chatham, Barnstable, September 14, 1997, was accepted unanimously by the Committee in its third report (Petersen 1998; 1997-24) despite the remarkably early date (most Ash-throated Flycatchers in the Northeast occur from late October to January) and its aberrant (leucistic) plumage. Jeremiah Trimble was one of the observers of the record, and when he reviewed the photos of the bird in 2010, he realized that a mistake had been made. 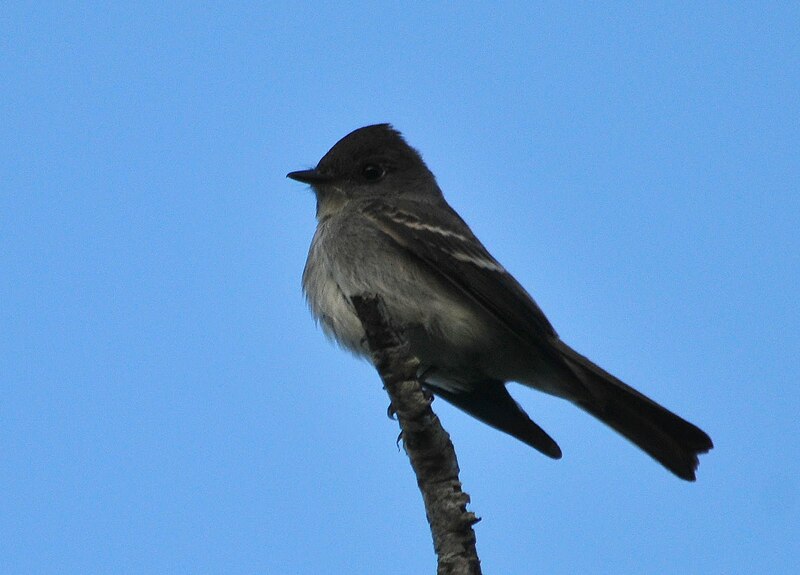 He resubmitted the record with reasoning for why he believed it pertained to a Great Crested Flycatcher (Myiarchus crinitus). Blair Nikula, the other observer on the initial record, agreed, writing in his comments: “I don’t know what I was smoking on 9/14/97…but this bird was quite clearly a Great Crested Flycatcher. It is a disturbing and humbling (but hopefully rare) example of how easily one (or several) can wander astray without a close and critical examination.” The Committee unanimously agreed (again) with the re-identification as Great Crested. This record serves as a valuable lesson for the importance of record documentation and archiving through the Committee process. All birders make mistakes, and in this case the mistaken included all of the MARC members who validated the initial submission as Ash-throated. The archiving of the original photos and documentation, however, made it possible to easily reassess the record to arrive at the correct identification. Had Trimble and Nikula not provided such detailed evidence for their 1997 claim, this record might persist in the record books as Massachusetts’ earliest-ever Ash-throated Flycatcher. Austin, J. J., V. Bretagnolle, and E. Pasquet. 2004. A Global Molecular Phylogeny of the Small Puffinus Shearwaters and Implications for Systematics of the Little-Audubon’s Shearwater Complex. Auk 121(3): 847–864. Clements, James F. 2010. Clements Checklist of Birds of the World 6.5. Available online at http://www.birds.cornell.edu/clementschecklist. Dwight, J. 1897. A Species of Shearwater (Puffinus assimilis Gould) New to the North American Fauna. Proc. Biol. Soc. Washington 11: 69-70. Ellison, W. G., and N. L. Martin. 2004. The Fall Migration 2003: New England Region. North American Birds 58: 36-41. Field Notes of Rhode Island Birds. 1991. 270: 2, 6. Finch, D. W., W. C. Russell, and E. V. Thompson. 1978. Pelagic Birds in the Gulf of Maine. American Birds 32(2): 140-155. Mactavish, B. 2004. Atlantic Provinces & St. Pierre et Miquelon. NAB 58(1): 30-32. McCaskie, G., and K. L. Garrett. 2006. Southern California. North American Birds 61(1): 142-146. Miliotis, P., and P. A. Buckley. 1975. The Massachusetts Ross’ Gull. American Birds 29(3): 643-646. Mitra, S. S., and Fritz, J. 2002. Two Great White Herons (Ardea (herodias) occidentalis) in New York, Sept-Nov 2001. Kingbird 52(1): 27-34. New York State Avian Records Committee. 2008. Report of the New York State Avian Records Committee for 2005. Kingbird 58(4): 310-338. Persons, T. B., and M. Petrucha. 2009. First Record of Kirtland’s Warbler (Dendroica kirtlandii) for Maine. North American Birds 63(2): 345-347. Peters, J. L. 1924. A Second North American Record of Puffinus assimilis. Auk 41: 337-338. Petersen, W. R. 1995. First Report of the Massachusetts Avian Records Committee. Bird Observer 23(5): 263–274. Petersen, W. R. 1998. Third Report of the Massachusetts Avian Records Committee. Bird Observer 26(6): 276–284. Post, W., and S. A. Gauthreaux Jr. 1989. Status and Distribution of South Carolina Birds. Charleston, SC: The Charleston Museum. Rhode Island Avian Records Committee. 2010. First Report of the Rhode Island Avian Records Committee. Bird Observer 38(5): 275-283. Rines, M. 2008. Twelfth Report of the Massachusetts Avian Records Committee. Bird Observer 36(2): 90-98. Robb, M., K. Mullarney, and The Sound Approach. 2008. Petrels Night and Day: A Sound Approach Guide. Dorset, UK: The Sound Approach. Sherman, J. W. 1917. Kirtland Warbler in Massachusetts. Records of Walks and Talks with Nature 9: 8-9. Tufts, R. W. 1961. The Birds of Nova Scotia. Halifax: Nova Scotia Museum. Veit, R. R., and W. R. Petersen. 1993. Birds of Massachusetts. Lincoln, MA: Massachusetts Audubon Society. Wheeler, B. K. 2003. Raptors of Eastern North America. Princeton, N.J.: Princeton University Press.